KoSA Cuba held the thirteenth edition of its annual workshop and festival this past March 1–8. Participants came from the USA, Switzerland, Italy, Canada, and Argentina. The program’s itinerary included informative classes, hands-on lessons, and musical performances by the talented KoSA Cuba faculty. The week started with a conference and introduction to Cuban music by ethno-musicologist Dr. Olavo Alén. Educational clinics featured percussion greats like Juan Carlos Rojas, long-time drummer for Chucho Valdez, who gave an exciting clinic focusing on Latin jazz drumset. Drummer Giraldo Piloto also gave a class on the development of timba style and Latin jazz drumming in today’s music in Cuba. Also instructing was conguero Tomas “El Panga” Ramos. The great timbalero Amadito Valdés (best known for his work with the famous Buena Vista Social Club) gave an engaging introductory clinic on timbales in relation to the clave. The inimitable Enrique Pla, famous for his work with Irakere and the Cuban development of fusion and Latin jazz, was yet another highlight of the week. The nightly concerts included performances by many of Cuba’s top drummers and percussionists, including Oliver Valdes, Ramses Rodriguez, Rodney Barreto, and great ensembles such as Alicia Alonso National Ballet Company, Havana Compas Dance, Los Papines, Roberto Fonseca, and Pupy y Los que Son. Additional classes during the week were taught by two Klimax group percussionists, Jean Roberto Figueroa and Julio Lopez. The festival finale concert at the legendary Karl Marx Theatre featured performances by many of Cuba’s best-known groups, such as NG la Banda, Compania Santiago Alfonso, Manolito Simonet, Lazarito Valdes y Bamboleo Brenda Navarette, and the legendary drummer Giraldo Piloto and his band Klimax. 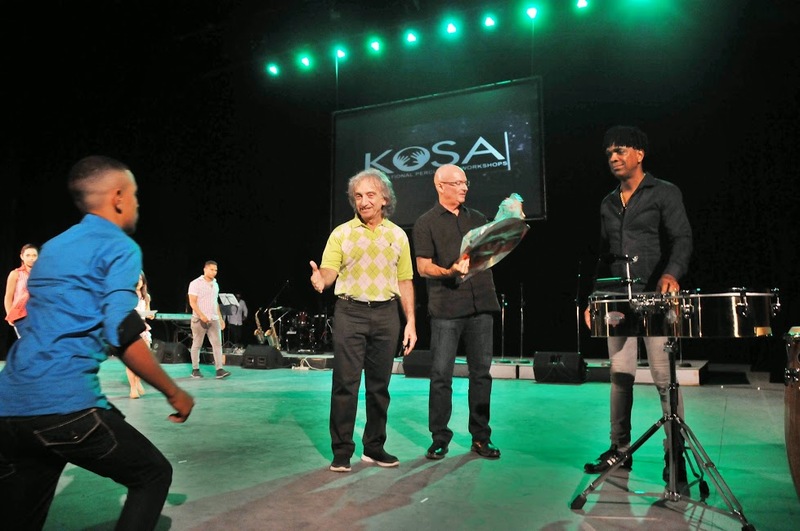 KoSA Cuba 2015 Fiesta del Tambor (Havana Rhythm and Dance Festival) was sponsored in part by Sabian, Gon Bops, Evans, Promark, Regal Tip, and KoSA Music. Dates for KoSA Cuba Workshop and Havana Rhythm and Dance Festival are February 28 to March 6, 2016.